A starter is, well…a great place to start! Whether you’re hosting a festive get together or enjoying a stripped-down meal at home with the family, a thoughtful starter can add a real sense of occasion to a midweek meal. I realize that cured fish starters can seem daunting at first glance, but I find that most of the difficulty lies within the sourcing of the fish itself. To ensure that you are working with a product that is super fresh and of the highest quality, shop in a high-street fishmonger and explain that you intend to cure the fish at home then eat it virtually raw. These fish starters in their simplest format work well as light lunches, but can easily be dressed up for a dinner-party starter course. 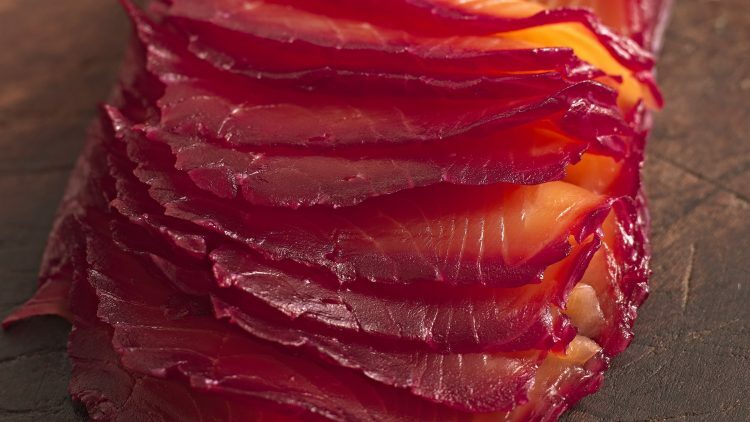 For a great recipe with which to test the waters (pun intended), try this simple ‘Beetroot Cured Salmon Gravadlax’. Gravadlax – or gravlax – was first made by Scandinavian fishermen, who preserved the salmon they caught by salting the fish and burying them in the sand. All we do is replace the sand with a salt and sugar mixture, which draws the moisture out of the fish and ‘cooks’ it, leaving behind firm and sweet, slightly salty flesh. To give it an original and interesting twist, I’ve added orange, lemon verbena tea leaves and beetroot. The citrus elements balance the natural fattiness of the salmon, and the beetroot adds a real earthy tone as well as giving a wonderful visual effect.